Why hire a Professional Fundraising Auctioneer? When businesses hire new employees, they will generally seek out the best, most experienced individuals to fill the position. Why wouldn’t you want the same for your Fundraiser and Charity Auctions? Are you considering a Live Auction at your next Fundraising Event? The Auction Guy only uses professional Fundraising Auctioneers. For over 20 years, our Charitable Event Auctioneers have raised millions of dollars at Fundraising Auctions throughout South-Central Ontario and the Greater Toronto Area. 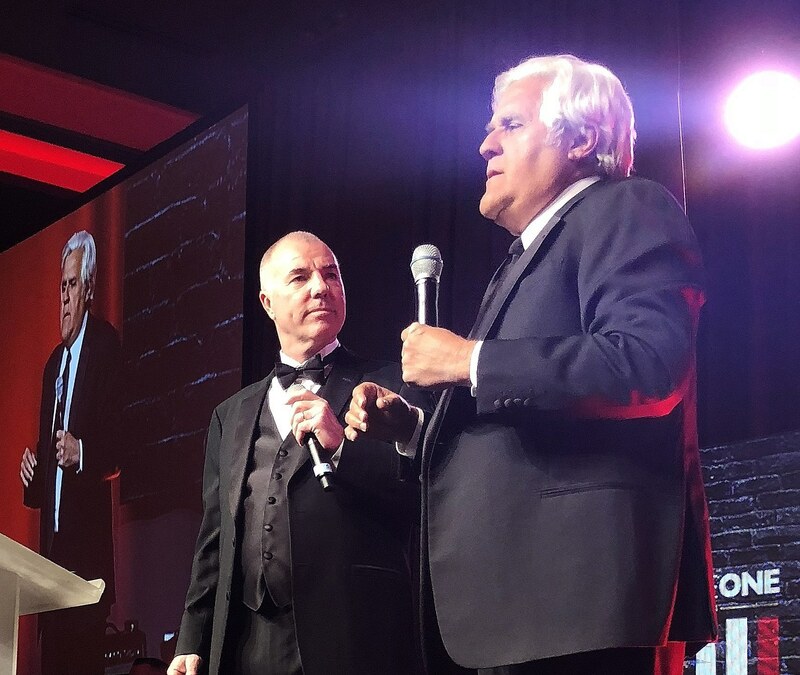 From large Gala Fundraisers to local Charity Events, you can depend on The Auction Guy to bring a unique level of humor and excitement that is trademark. 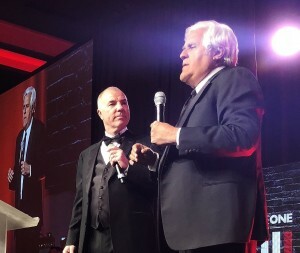 Dan Clark, The Auction Guy with Jay Leno helped raise $258,500 at the 2018 Trillium Health Laugh Out Loud Gala Auction. For Silent Auctions, The Auction Guy provides a “no-cost, no-obligation” service. All items are provided for the Silent Auction with no upfront costs to you or to your Organization. Our experienced Silent Auction staff will help develop the best strategy for your Fundraising Auction Event. We will assist in determining the right selection of exciting auction items tailored to suit your guests’ unique tastes and budget. Whether it’s Artwork, Appraised Jewelry, Home Décor, Sports Collectables or more, The Auction Guy is here to help! From the planning stage to the day of your event, our team will work together with you to incorporate the best strategies for maximized success. Have you ever considered an Online Fundraising Auction? An Online Fundraising Auction in a new and innovative approach to fundraising allowing you to host a fundraiser without necessarily all the hassle of having to organize an event. Different from a Silent Auction, Bidders use our Online Auction platform to bid on items using their laptops, smart phones and personal tablets. Once you have contacted The Auction Guy, we will begin to work together to develop a strategy to maximize your fundraising auction results. We will set up your own individual URL for your online fundraising auction. Our Home Page will be used to promote your online auction throughout the duration of the sale. We will work together to determine the right selection of auction items for your online auction as well as include any donated auction items that you may have. In addition to your Organizations own contact list and Social Media outlets, we will also use our extensive auction following to better promote your online fundraising auction and your cause. The Online Fundraising Auction normally runs for a period of 1 week. allowing bidders to bid on auctions items anytime from anywhere. Upon the close of the Online Fundraising Auction, successful bidders are notified by email of their winning bid and payment is collected. Online Auction items can be delivered directly to your location prior to the close of the online auction to allow for preview of the auction items and to allow for easy pickup. Full payment of all money owed to the Host Organization will be made complete with itemized auction sale summary within five business days of the close of the online fundraising auction. Allows you to host your own Fundraising Auction without the trouble of organizing an event. By having the Online Fundraising Auctions run for a 1 week period, this no longer limits the number of potential supporters to those that attend a live event. Promoting your fundraising event on our Home Page, enables you to reach a larger audience raising more money and awareness for your cause. Add a direct link to your Organization or cause through our web site. When combined with our Silent Auction Services, an Online Fundraising Auction can also allow for pre-event bidding. Do you want to raise more money at your next Fundraising Auction Event? Contact Us.